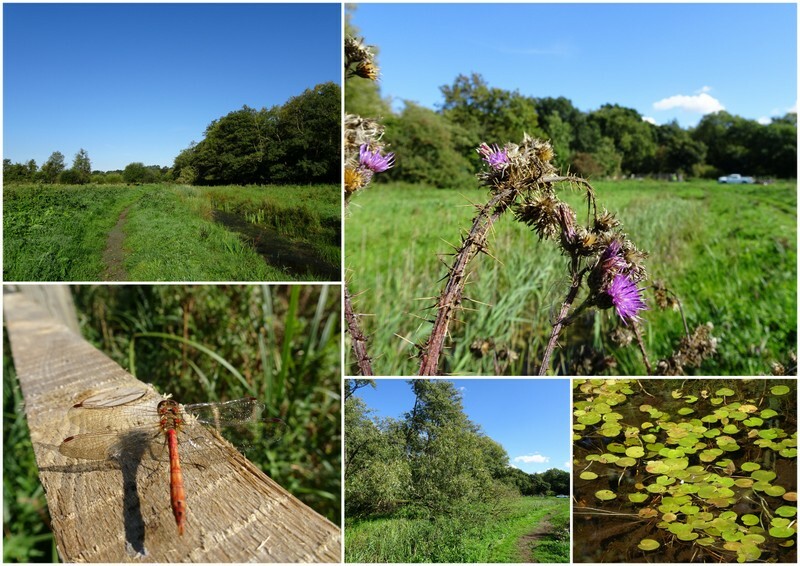 It has been a bit of a strange summer in some respects with things not growing very much for a few months and then suddenly everything takes off just when we should be ramping down for the Autumn. 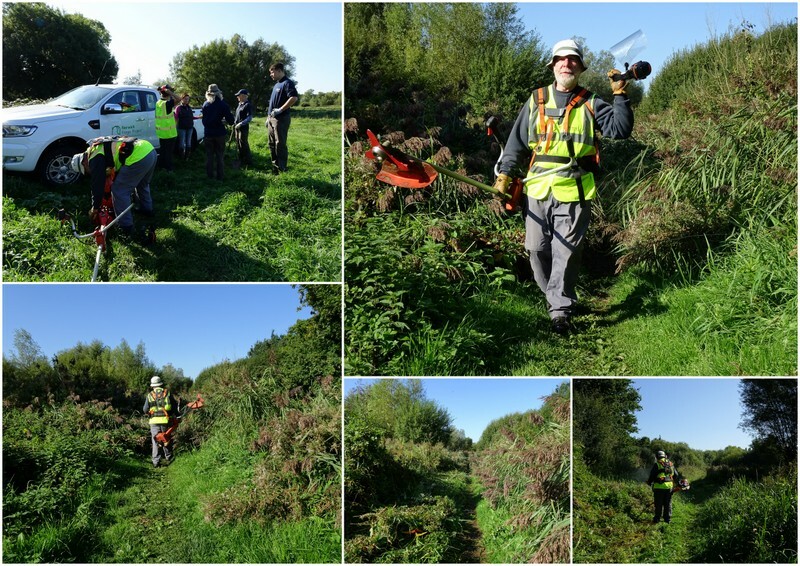 A trip to Marston Marsh on Thursday found us taking on a variety of jobs to catch up with the recent growth spurt. There were path edges to cut and footpath repairs to get sorted. Robert and I took the brush cutters and set about the path that runs parallel with Marston Lane. We don’t let the cattle graze this area to prevent the spread of an invasive non-native pond weed. Which means that the reeds and meadowsweet were standing at least 5-foot-tall and the path had narrowed to a couple of feet wide in places. Robert started at one end and I the other and we worked our way along the sides until our fuel tanks emptied and it was time to return to the truck for tea. Meanwhile Fireman Chris was trying to cut the sides of a section of the main footpath with the DR mower, but the nettles and other stuff was so tall that the rotary mower kept getting clogged up. This is another area that is not grazed by the cattle, so we have to do the job that they can do so efficiently and tirelessly. The solution was to brush cut the sides of the path first to get the growth down to a manageable length so that the mower could cope. Chris was then able to continue with his mission. When a dyke was dug out a few years back the arisings were piled up to form a bund running alongside the dyke topped with a footpath. A layer of plastic netting was secured on the top of the bund and covered with soil, grass and other stuff was allowed to grow through it before being opened to walkers. With hindsight it could have done with a thicker layer of soil since people and cattle have worn away the surface exposing the netting which had broken and curled up. 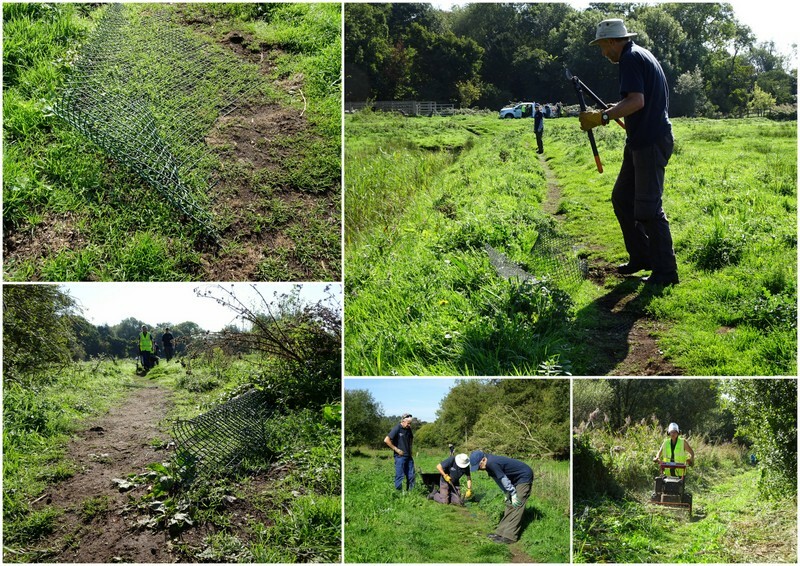 Sue, Rob, Chrissie, Tim, Erin and Luke spent a lot of time on their knees cutting out the exposed netting and topping up the bank with soil. A lot of jobs done on a very warm and sunny day. We were sustained by doughnuts (and runner beans!) donated by Pete and cookies Paula had made with her grandchild. ← A day in the Country and then off to the Pub!